The magnetic tape is the oldest memory media for computers, still in use today. A tape was used for the first time to record data in 1951 in the Mauchly-Eckert UNIVAC I computer, and still in use today as a cheap and reusable archive media. As one of the possible beginnings of the story of the magnetic recording happened on September 8th, 1888, when in the article "Some Possible Forms of Phonograph" of the British magazine Electrical World, Oberlin Smith (1840-1926), the founder of Ferracute Machine Co. in Bridgeton, New Jersey, USA, published one of the earliest known works, dealing with magnetic recording, and suggested the use of permanent magnetic impressions for the recording of sound. In 1877 Oberlin Smith learns of the invention of magnetic sound recording device (Phonograph) by Thomas Edison and decided to improve the Edison phonograph, without initially getting away from magnetic sound recording. 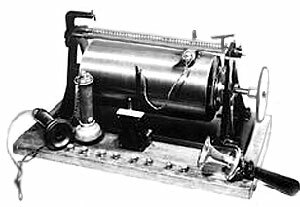 In 1878 Smith conceived a Electric Phonograph or Recording Telephone and draws up a "Caveat" (temporary patent) for the US Patent Office to a certain extent as a preliminary stage for a patent application on an Electric Phonograph or Recording Telephone, which deals exclusively with magnetic sound recording. Oberlin had fabricated a cotton or silk thread (see the nearby drawing from the 1878 "Caveat"), into which steel dust or short clippings of fine wire would be suspended. These particles were to be magnetized in accordance with the alternating current from a microphone source. Smith also discussed the possibility of using a hard steel wire, but thought it scarcely possible. It seems however that a working unit was never built. 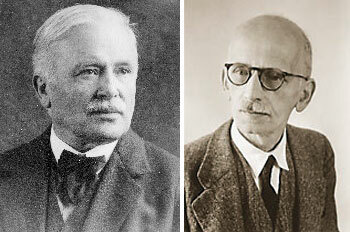 The Smith's ideas were further developed by the Danish engineer Valdemar Poulsen (1869–1942). In 1894 Poulsen discovered the magnetic recording principle while working as a mechanic in the Copenhagen Telegraph Company. 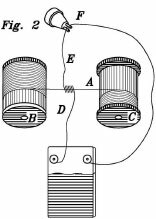 In 1898 in his Telegraphone (see the nearby image) he implemented for the first time the magnetic wire, and it was the first practical apparatus for magnetic sound recording and reproduction. In the same 1898 Poulsen obtained patent in Denmark for his device, and later did the same in other countries, see for example US patent 661619). Magnetic wire recording, and its successor, magnetic tape recording, involve the use of a magnetizable medium which moves past a recording head. An electrical signal, which is analogous to the sound that is to be recorded, is fed to the recording head, inducing a pattern of magnetization similar to the signal. A playback head (which may be the same as the recording head) can then pick up the changes in the magnetic field from the tape and convert them into an electrical signal. Poulsen later developed other magnetic recorders that recorded on steel wire, tape, or disks. None of these devices had electronic amplification, but the recorded signal was easily strong enough to be heard through a headset or even transmitted on telephone wires. On the 1900 World Exposition in Paris, Poulsen had the chance to record the voice of Emperor Franz Josef of Austria, today preserved in the Danish Museum of Science and Technology as the oldest magnetic sound recording in existence. When Poulsen's patent expired in 1918, it was Germany to led efforts to improved magnetic recording. 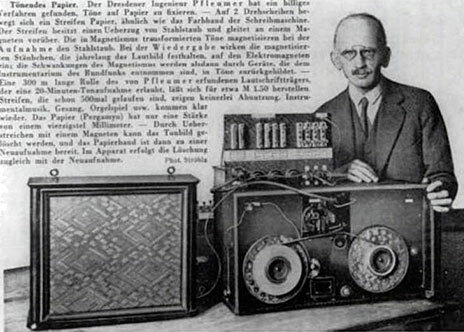 In the early 1920's German inventor and entrepreneur Dr. Curt Stille (1873-1957) from Berlin modified Poulsen's Telegraphone to use electronic amplification and marketed the patent rights to the device, a wire recorder, to German and British companies. In 1928, Stille formed the Echophone Co. and contracted with Ferdinand Schuchard AG and its talented young engineer Semi Joseph Begun (1905-1995) to manufacture the Dailygraph, the first cassette (magnetic wire) recorder. Semi Joseph Begun also developed the Stahltone-Bandmaschine steel 6 mm wide tape recorder in 1935. Wire and steel tape however were not a good solution and would be replaced in the 1930s by thin plastic tape, conceived by Fritz Pfleumer. Dr. Fritz Pfleumer (20 March 1881, Salzburg, Austria – 29 August 1945, Radebeul, Germany) was a German-Austrian engineer. He graduated engineering at University of Dresden in 1902. Pfleumer had developed a process for putting metal stripes on cigarette papers, and reasoned that he could similarly coat a magnetic stripe, to be used as an alternative to wire recording. In 1927, after experimenting with various materials, Pfleumer used very thin paper which he coated with iron oxide powder using lacquer as glue. Pfleumer was granted in 1928 a patent in Germany for the application of magnetic powders to strip of paper or film. In 1930 the AEG (Allgemeine Elektrizitatsgesellschaft) company in Berlin, decided to start the development of the Magnetophone machine, based on the Pfleumer principle and in 1932 Pfleumer granted the right of use to the AEG that based on his invention. In the same 1932 AEG signed an agreement of collaboration with BASF, company of Ludwigshafen: AEG developed the system, BASF an appropriate sound carrier. BASF had a rich experience and in 1934 was able to ship the first 50000 meters of magnetic tape. The tape consisted of a foil of cellulose acetate as carrier material, coated with a lacquer of iron oxide as magnetic pigment and cellulose acetate as binder. During the 1935 Radio Fair in Berlin the Magnetophone and the Magnetic Tape (see the image below) were presented to the public. In 1936 the German National Court cancelled the Pfleumer's patent, because his idea of coating paper tape with iron dust was covered in Valdemar Poulsen's original patents of 1898 and 1899, so Poulsen stands alone as the inventor of all magnetic recording. 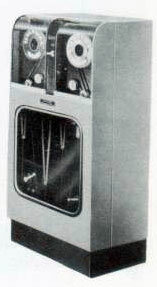 The magnetic tape was not used to record data until 1950, when the UNISERVO I (see the nearby image), first digital tape recorder was developed in Eckert-Mauchly Co. and was implemented in the 1951 UNIVAC I computer. UNIVAC I had 2 types I/O devices: An operator's console, and up to 10 UNISERVO tape drives. The recording medium was a 1/2 (13 mm) inch-wide thin band of nickel-plated phosphor bronze (so called Vicalloy). The tape was 1200 feet long. Recording density was 128 bits per inch on eight tracks (six for the data value, one parity channel for error checking, and one timing channel) at a linear speed of 100 inches per second, yielding a data rate of 12800 characters per second. The UNISERVO drive supported both forward and backward modes on read or write operation. This offered significant advantages in data sorting and merging applications. The data transfers to/from the UNIVAC I processor were fully buffered in a one block dedicated memory, permitting instruction execution in parallel with tape movement and data transfer. The internal serial data path permitted inserting a tape data block into main memory in one instruction. 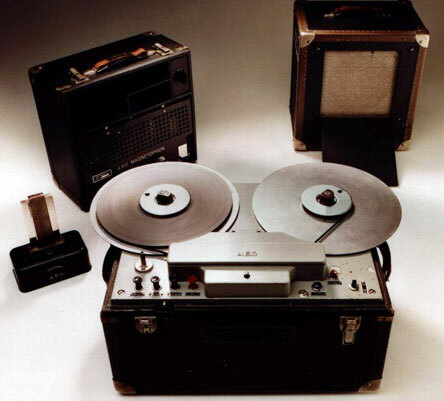 The tape devices and media technologies covered a long distance since 1950s. Let see for example the new IBM TS2280 Tape Drive (see the image below), with its data transfer rate of up to 750 MBps (compared with 12.8 KBps for UNISERVO I), storage capacity up to 30.0 TB (184 KB for UNISERVO), etc.